Having had the opportunity to visit Haiti twice in the last ten years, the images and stories on the news feel doubly painful. The sights, sounds and smells now return, not with nostalgia, but with a pathetic sadness. While our sister church and the people we know in Haiti have been spared from death and injury, there are so many who are obviously in grief and unimaginable pain. A family in Port Orchard mourns the loss of their daughter who was working in an orphanage. 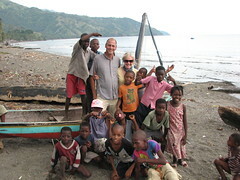 Fortunately, a good friend from church, Rebecca Miner, is safe in Cape Haitian. It is difficult to understand how a country so close to the US can be so deprived and now devastated. It is likewise difficult to comprehend God's purposes in natural disasters. We can only trust in His wisdom. We can also hope that in the rebuilding of this country, social and political dynamics will change to allow the people of Haiti to rise up with dignity and hope. I was wondering how your sister church was affected. Glad to hear they are all ok. The devastation in Haiti is unbelievable. Everyone's worst nightmare of what damage an earthquake could do. we were wondering if you knew the girl from PO that worked in the orphanage ive been following her story i was wondering if your feeling 'called' back to haiti? !